Within a short span of time following the introduction of its Heavy Truck range into the Indian Market, BharatBenz has now overtaken Mahindra Navistar in HCV segment for the month of March in the last quarter of FY 2012-13. One of the major reason of this mini success is the strong acceptance by customers. 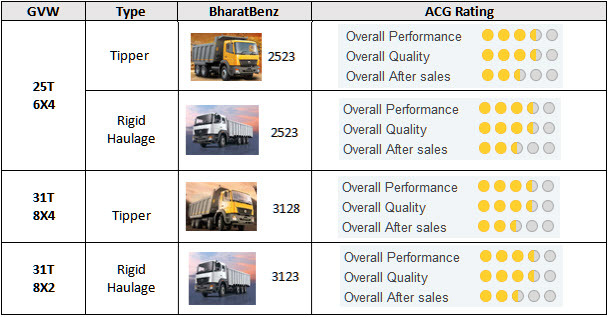 As per the study conducted by ACG, customers are accepting BharatBenz due to its price competitiveness, Cab comfort (highly recommended by drivers), powerful engine and less sound, better mileage and Captive finance. 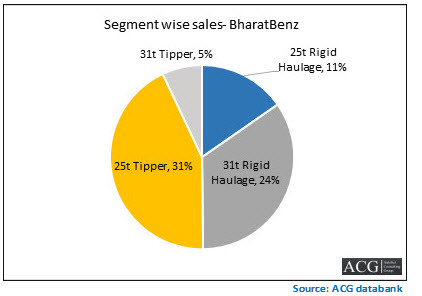 As the title of ACG’s best-selling Research Report implies “BharatBenz – The Game Changer”, we believe this is just the beginning of good times to come for the German giants in Indian Truck Market. Nevertheless this is just a warning shot of the big players on the segment. 25T Tipper and 31t Rigid Haulage contributes more than 50% of sales. It is notable that both of them have invested similar amounts in India, Mahindra around 4000 Crore and BharatBenz 4400 Crore Indian Rupees respectively. Mahindra Navistar lauched their first product n 2009, and they do posses substantial knowledge and understanding of the local market. On the contrary BharatBenz has only started its commercial operation in September 2012. We believe it is inevitable that Mahindra should review its complete market and product strategy to get anything out of this market. More evidently they should also review the promotional and branding strategy, ACG report finds that their message is not often reaching the end user. Truck Industry is having specific requirement which OEM should realize and implement. Marketing ROI are having different formula and definition of each function. Nicolas Fronteau, Operations Director of APEEC Solutions, Barcelona who is a technology Partner of ACG comments that " In this strategic context, it is crucial for MN to integrate an In-Vehicle Network that would allow them to play on truck variances and broad their options offering to gain market shares by providing the market with fast time-to-market trucks. " Having said all these , BharatBenz should be consistent in delivering Customer Satisfaction and Product Performance in a highly competitive and dynamic Indian Truck Market. Adding to this a strong built on Brand Image and Marketing Strategy in near future will soon put BharatBenz as one of the dominant brands in India. Congrats on a comprehensive report. With a strong brand image in terms of performance and quality, it is not very surprising that the new introductions by Benz are taken well by the customers and hence the spike. However, in trucking industry, it is the after sales service that decides the sustaining power. MNAL has setup a strong after sales network which is yet to shape up for Bharat Benz. It would be too soon to comment on how much better, if at all, one would do than other. Nevertheless, Bharat Benz is a competitor to watch out for…! Thanks for the comment Mr. Rohit. 100% agreed that a strong After Sales Network is important to up the ante in the Truck Industry. This is what BharatBenz are strengthening at the moment. A 100+ Dealership points with Workshops is what set in their initial plan. About half of them are yet to be finished , but quite soon their network reach will be transformed from a ‘limited’ to ‘pan india’ . Now we could expect other OEMs altering their strategies. 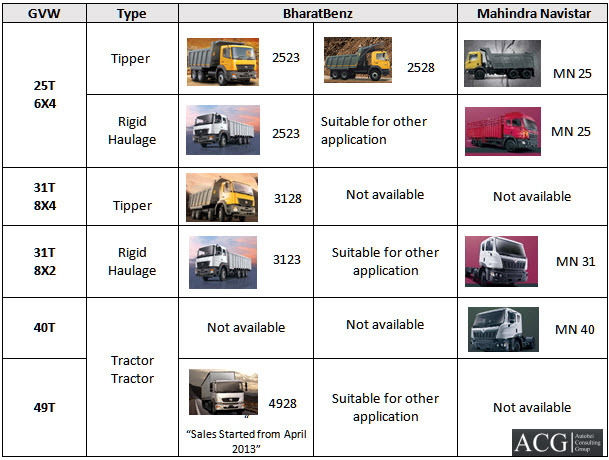 I always believe that Indian Truck Market is very competitive and dynamic. Its up to BharatBenz to consistently tweak up what they lack in the market to go further up. With a right strategy I can see them becoming extremely competent. And surely they are a brand to watch. I think its not just BharatBenz or Manhindra’s in the Indian Trucking industry but also brands like Volvo and Scania are to take note of. Good for the customers to have a varied choice. The one with the best 3S facilities would triumph in the market. With the backing of Mercedes Benz in every way & especially the technology side, BB has come out to be one of the best balanced truck in Indian trucking industry. I hope now that drivers get the choice of better & safe cabines all old timer truck OEMs shd stop offering Cowl Chassis. Second important thing is power to weight ratio, with better road surface & width it is very painfull to drive behind slow moving under powered truck. BB has done great job to introduce higher power trucks. I am sure for drivers & for the road users it is great to see Indian built good looking safe haulage vehicle on the roads. Good job done BHARATBENZ. Thanks for updating the latest trends in the market. I would be glad if you could share how BB is picthing on other biggies and smaller players like AMW, MAN etc., and give provide some insight where exactly this war is leading us. My specific question represents component and aggregate manufacturers. surprising thing why only MNAL alone is taken over. Very skewed research I must say – Mahindra also has two engine variants – 170HP and 210HP in MN25 (tipper as well as Haulage). In MN40, they have a 260HP variant CRDE engine too. The product portfolio doesn’t capture these and there are suggestions to expand the product offering? We compared just the base model otherwise bharatbenz is having more variant then MN. That was really informative. But as far as i have heard Navistar opting out of the collaboration at present and Bharath Benz offering a technically good product range they have started gaining better visibility on roads than MN. The Bharath Benz trucks on-road are technically proven ones that are in operation in countries like Brazil. That is a really well written article and is useful information. Thank you for the post. Its only a beginning of BharatBenz in Indian Truck industry and this achievement within a short period of time is commendable. It is for the first time in the 125 years history of Daimler AG, Germany to have a country specific brand only for India as they foresee India as the next economic giant. Global players (Mercedes, Volvo, Scania etc) have raised the bars in terms of Quality, Technology, Durability and Reliability (the four pillars in Commercial Vehicle requirements), they will redefine brand positioning in the market. Now all the domestic players like Tata, Ashok Leyland, Mahindra & Swaraj Mazda will have to pull up their socks and invest heavily to upgrade their product technology and further strengthen their dealer Network to defend their market share. The CV industry in India is expected to have CAGR (compound annual growth rate) of 15% and is expected to reach 1.6 million mark in next 5 years. With a promise to deliver better FE than any other competition vehicle, DICV has surely played its card right. Owning a DICV vehicle makes the owner proud, as it has a sense of “BENZ” attached to it. 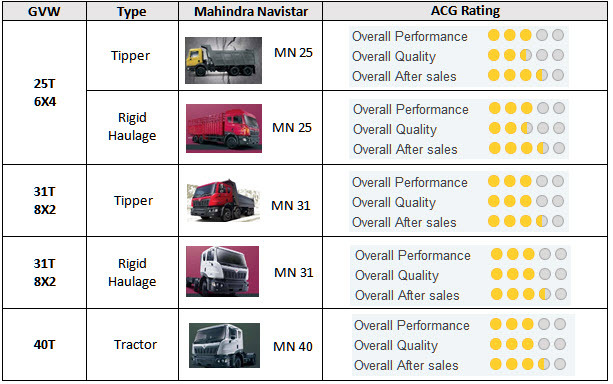 One major fractor playing an active role here is the rugged looks DICV trucks posess as compared to Navistar vehicles. Afterall Perception & word of mouth drives the commercial segment. I had talks with owners of BB trucks, and they are very happy. Yes, these are a better technology trucks, and the price value equation is very good. The fear in the market is the spare part prices and service capabilities where most of the truck owners feel the pinch. AL has a back order of 5 months, and Tata of 3 months – there by making spurious part makers thrive. With BB – there is also a possibility of AMW getting in tougher position, as they do not have technology, nor any big brand. Also the volumes being low – that will ad to the financial pressure. With Tata, AL, Eicher, Navistar, AMW & BB – 6 manufacturer – and the total market of about 30,000 (max levels) the volumes is not there for more than 3 to survive. The industry is shrinking with more number of manufacturers getting into the blind race. The best is yet to be seen with China based Photon motors setting up base here for there range of trucks. Yes, AMW now known as AMWML (AMW motors ltd) has already started feeling the heat, the tipper sales (bread n butter for them) are already heading North. Frankly i was expecting the Navistar to be more upmarket as far as the overall fit n finish is considered. The interiors are plain with nothing much to excite the Owner or Driver. It was bit of a let down, the ride was quite small to comment on drivability or FE like parameters. Why i am focussing on quality n interiors is for the fact that it is the new trend in the trucking industry, car like is the need of the hour for manufacturers like TATA Prima, DICV & AMWML pushing the new agenda of driver comfort. It was a nice comparisons of two growing commercial vehicle giants in Indian industry I would like to where small players like amw and man stand at the moment. Market also has a strong rumour that amw will clarify and MAN is thinking of strategic alliance with scannia how the market responds to it is the bigger question that needs to be answered. Thanks very informative article. I believe Indian commercial vehicle industry is at very interesting turning point, where we are witnessing pressure on existing local player due to slow down ,and on the other hand international player trying to gain market share ,and make their presence felt. I think the article is well written and covers a good range of elements to forecast the growth path in this segment. As per my view, I see that the Brand Perception is going to play a crucial role here subconsciously in the minds of the end customers. Certainly I agree with Mr. Tarik Arora that one factor in the decision making is coming out to be “Benz”. Customers perceive it to be of superior quality and performance. Secondly about the product proposition that BharatBenz has kept makes the brand perception still stronger.With a 9% price slated up customer get the feel that Of-course the quality is not sacrificed. Further BharatBenz has made it clear that along-with superior quality, the performance will also improve and thus they have offered 10% fuel efficiency. This reduces the operating cost and lures the commercial customers. Thirdly with the product range and service offering for e.g. Engine Oil Drain interval of 50000 KMs as compared to 25000 KM claims by competitors + engine overhaul period of 3 Lakh Kms as compared to competitors 1 Lakh KMs are some of the strong positions with BB. With respect to the distribution network currently BB has approx 30 dealor locations covering mostly the southern, central, partly eastern and western regions. In phase 2 this would end up covering 102 locations which would span all India. Futher the OEM tie ups that BB has done shall have to ensure better delivery of spares/service material to ensure customers have the experience of “all under one place” proposition given by BharatBenz. Bharat Benz dealers will play a major role in maintaining and deepening the Brand Image in the years to come. I am a small businessman from rajasthan, sir you all are more educated then me I only wants to know that if I can buy bharatbenz 2523 for transporting milk from collection centre to processing plant its safe to investment with new brand because we are using tata 2518 and 3118 for last 4 to 5 year’s .we are only concern about after sales service and bharatbenz mileage promise. This is good analysis, lessons to learn for both the companies, we will watch the trend one year down the line once we recover from the current slow down. Wonderful, This website provides helpful information to us, keep it up. YES, BHARATBENZ’s vehicles are far better than Tata Motors.